Editor's note: Watch Erin Burnett's exclusive interview with Academi CEO Ted Wright on OutFront. Monday night 7pET. The company once known as the world's most notorious private security contractor, Blackwater, is changing its name and its look once again in a bid to prove that it has outgrown its toxic reputation. Renaming the company "ACADEMI" tops a number of changes that have been made by a private equity consortium that purchased the company from former owner Erik Prince last year. "The message here is not that we're changing the name," said Ted Wright, who came on as the new company CEO in June. "The message is that we're changing the company, and the name just reflects those changes. We have new owners, a new board of directors, a new management team, new location, new attitude on governance, new openness, new strategy - it's a whole new company." 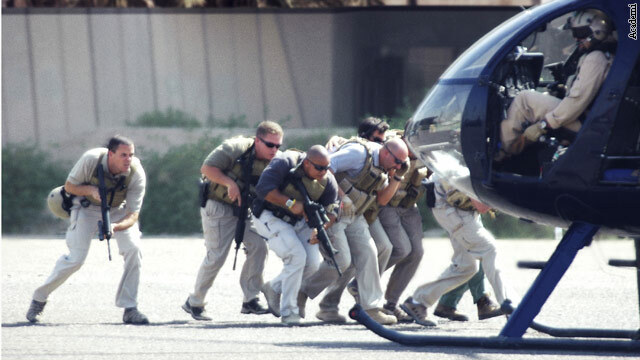 Blackwater was dogged by controversy as it rose from a training facility in Moyock, North Carolina, in the late '90s, to a private security powerhouse at the height of the war in Iraq. But as business boomed, so did the demand for growth, and rules regarding issues like compliance and governance were sometimes not followed. There were also accusations that some Blackwater guards operating in Iraq's virtually lawless environment were heavy-handed, and then a deadly shooting in a Baghdad traffic circle in 2007 was the beginning of the end for the company. Prince tried changing the Blackwater name to Xe, before selling it late last year to the group of investors led by Jason DeYonker, a managing partner at Forte Capital Advisors, and Dean Bosacki, managing partner of Manhattan Partners. The other investing partners remain anonymous. Prince has an earn-out agreement over a set number of years, meaning he will continue to be paid on Academi's business, but Wright says "the agreement is for a finite period, a significant portion of which has already passed." Wright insists that Prince has nothing to do with the day-to-day running of the company. In fact, he says he's never even met Erik Prince. The damage to Blackwater's reputation after the Nisoor Square shooting in Baghdad was bad for business. The company lost its most lucrative contract with the State Department and today only brings in about a third of the revenue it once did. While Prince was the sole owner of Blackwater and answered to no one, the new company has formed a board of directors, headed by businessman Red McCombs. He was joined earlier this year by former Attorney General John Ashcroft and retired Adm. Bobby Inman, former director of the National Security Agency and former deputy director of the CIA. Most of the executive suites from the Blackwater days were cleared out, and the last major change to be announced was Wright's hiring from fellow government contractor KBR in June. Wright now has the unenviable task of changing the minds of those who became passionate Blackwater-haters, some of them are members of Congress, which has oversight control over the company's government clients. Changing the company's reputation, or rather creating a new one, will be one challenge. Building new business will be another. There is little likelihood that ACADEMI will ever achieve the profits that Blackwater did at its peak while protecting State Department personnel in Iraq, but Wright says he isn't worried. "I don't know what the biggest year this company had was, 900 million (dollars) or something like that, and we're doing about 300 million," said Wright from his new high rise headquarter office in Arlington, Virginia. "I don't have to get up to that 900 million to be valuable on the earnings side." Wright would like to double the training side of the business. His company boasts one of the country's largest, most well-equipped training facilities, located in Moyock, in sparsely populated northeastern North Carolina. He's also exploring new business opportunities when it comes to certifying bodyguards for high net-worth individuals, such as celebrities or executives. He'd also like to expand the company's number of commercial clients such as oil and gas companies, and insurers who do business in dangerous parts of the world. "Hopefully we can reduce insurance rates for their clients so that they can bring us on as an offering to say, 'Hey listen, go use these people, they're gonna come and do an assessment for you and they're gonna improve your security environment and your insurance rates will go down," said Wright. Today, most of Academi's clients come from the government sector, so it's important to Wright that those government clients acknowledge the changes the company has made, starting with the name. "The only thing I had to convince them of is that this wasn't a Blackwater-to-Xe change," said Wright, implying that the first time then-owner Prince changed the company name, it was a change in name only. "This was a Xe to Academi change." Wright's true measure of success will be whether he can eventually bid for business in Iraq again. When the team of Blackwater guards opened fire in that Baghdad traffic circle in 2007, killing 17 Iraqi civilians, the Iraqi government banned Blackwater from operating in the country. "The day I'm allowed to do business in Iraq will be success," said Wright. "If the government of Iraq let's us do business there again, you know we've been successful." but wind pellucid of needless mental strain which can be pregnant at starchy occasions.